Home Renovation in South Bangalore, when you have an open room, you see many opportunities. You have unnumbered ideas to decorate your room. But, as soon as the furniture comes in, the hassle is started. According To Interior designers, furniture arrangement depends on how you like it, but certain rules must be followed. The principles are quite easy to apply, and they change the overall appearance of your room in no time. If you are one of those, who feel anxious when there is so much disturbance in the house, the rules are something you must have known before. Here are some easy principles to follow for that no so scary furniture arrangement process. The most important thing is knowing what you need. The type of furniture and even styles. Two sofas facing each other might seem symmetrically outstanding, but if you want to place them in front of the TV, no arrangement will work. So, it is better to know what you want in the room and how you want it to look like. The rug below the furniture must be chosen wisely. The first simplest thing to keep in kind is, if you are creating a conversation area, the mats you use must cover the floor below the whole of the furniture. If that’s not possible, make sure that it is covering at least the front part of big furniture to maintain balance. When all the furniture in your seating is resting on the rug, the disturbance is removed. The central focus of every seating is a coffee table. According to villa and apartment interior designers in Bangalore,the coffee table must be a big one. It should be able to hold all the snacks you want to offer to your guests in addition to the central artwork. If you can’t have a big coffee table, get two small tables for an aesthetically pleasing arrangement of your conversation area. A side table is there to provide all the comforts when you are in your cozy bed. It should be within reach if you want to pick up something or place something. For that, the simple rule is, put your table within one arm distance. Don’t end up with a layout that forces you to get up for smaller things because this way you will end up with a messy room every day because everyone is too lazy to stand up and place items on the place when their place isn’t within reach. When we have smaller rooms, we tend to shift the furniture as close to walls as possible to free up space. But, for your furniture’s goodness, don’t do it ever again. The furniture must be at least a few inches away from the walls to prevent the moisture from outside spoiling your furniture. Moreover, it makes space appear more prominent. Whether you have a natural one or you create new, a focal point can make a room appear so much better. If you don’t have a window or fireplace that can serve as a focal point, create one with furniture. You can make your coffee table and seating the focal point of your room if you don’t have anything. You need to balance out your furniture both in terms of shapes and sizes. While placing furniture, it is vital to make sure that all the smile sized pieces aren’t on one side and big sized ones on other. Balance out all the pieces you want in your home without forgetting the symmetry of shapes. If you’re going to have straight line shipping, a round coffee table will make everything right. The home interior designers in Bangalore can advise you more according to the type of furniture you have got. The wall behind your sofa must be designed carefully. The empty wall will not look good with a little artwork, and that’s why you need to be smarter. You can’t hang any sculpture, mirror, or artwork without taking shape and size into consideration. For example, if you have a small round mirror that you want to hang on the wall, make sure you decorate the corners with something elegant making it big. Everything small can be made to fit the space by adding additional things around like a sizeable matte frame. Every type of room follows a different theme. You can follow the arrangement rules to make every room speak for itself. Just like a conversation space has an area rug under the feet of a group of furniture, every room has a different furniture arrangement. If you want to create a dining room, hang a beautiful chandelier over the table, and you are done. The interior decorators in Yelahanka say that when a sofa has its back towards the whole room only facing the TV, it’s a living room. The height of the side table must be according to the height of the seating arrangement. Try to get both the items with the same size (the size of the table must be equal to the arm of the chair), but if you can’t, go for a lower height for the table. Similarly, the height of the coffee table must be equal to the height of the seat of the sofa or chair. Not necessary to say, you must maintain the walking distance between the seating and table. However, you should also mind that furniture in the traffic path must be of small height or should be arranged in such a way that it doesn’t block the way. Nothing works better than personal innovation. Experiment with your arrangements. If you are done with arranging furniture for one time, it doesn’t mean you can’t shift the chairs and sofas, do it as per your comfort because that’s the priority. Moreover, never stick to one style, and you will have a better room every time. Latest Kitchen Interior Design Ideas to be considered. Ingenious, space saving furniture ideas and designs. 7 Skills You Require To Become An Interior Designer. Everyone aspires to make a home of their dreams, a home that is a class in itself, an extension of your persona and likes. It is beyond the bounds of possibility to fulfill this dream without a kitchen that should be a perfect addition to the entire prospect of a home. 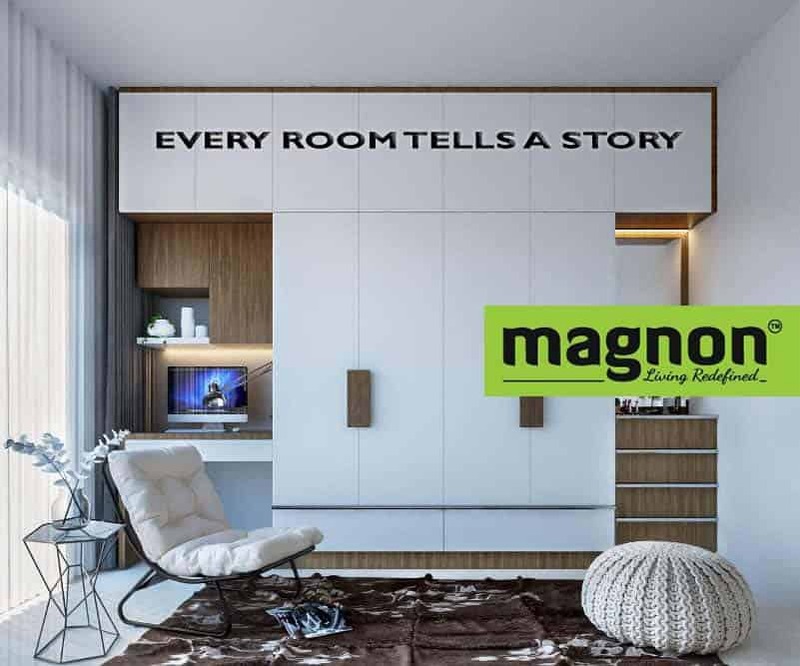 Magnon India ushers in a new era in the furnishing industry with their innovative and in-vogue products and alliances. © Copyright 2018 Magnon India. All rights reserved.